Under climate change scenarios, many urban areas in Southeast Asia may become increasingly susceptible to localized flooding due to greater rainfall extremes. This study focused on Rattanakosin Village, Thailand, a peri-urban area near Bangkok. Rainfall data from Don Mueang International Airport showed 2000 was similar to the 30 y norm, 1980–2011, and therefore was used as the baseline against which climate change scenarios were compared. PCSWMM, run at hourly increments with the 2000 rainfall, suggested 11 nodes in the village would flood for >24 h, with an annual flood volume of 367 200 000 L. The hourly synthetic rainfall time series for this area, generated by linking the ECHAM4 General Circulation Model with the PRECIS Regional Climate Model under the IPCC emission scenario B2, were run through PCSWMM for the years 2021, 2016, and 2091. PCSWMM results showed the number of nodes flooded for >24 h increased by 3 over the base case scenario and annual flood volume progressively increased from 370 554 000 L to 483 060 000 L between 2021 and 2091. The annual flood volume in 2091 was similar to that generated by simply increasing the 2000 rainfall by between 10% and 20%. 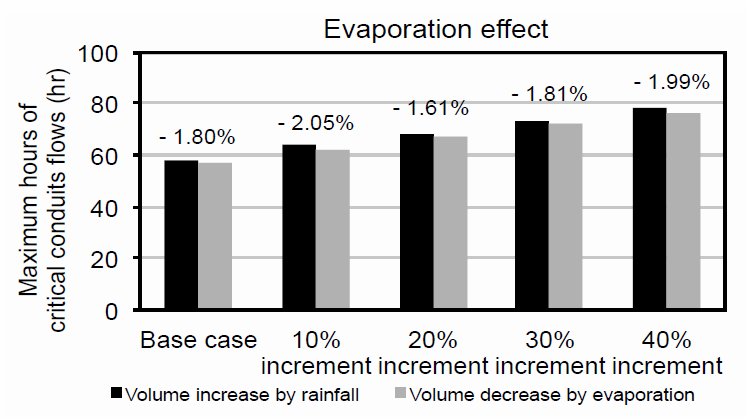 Increases in evaporation also were explored using PCSWMM, but compared to the changes in rainfall, evaporation had a smaller impact. With increasing evidence of change in climate within the last two decades, there has been growing concern about the possible impacts on urban environments (e.g. Semadeni-Davies et al. 2008, Rosenberg et al. 2010, Hirshman et al. 2011, Irvine, 2013). The probable effects of a changing climate provide a challenge for sustainable water resource management. Some possible examples of impacts on surface waters are increased contaminant discharge during floods, and rising temperature and oxygen depletion during droughts (Senhorst and Zwolsman, 2005). When analyzing the impact from climate change on urban drainage systems, the challenges are in what type of climate change projection to use and what parameters should be used to measure the impacts. General circulation models (GCMs) are widely used to assess the possible impacts of future climate change. Downscaling, using regional climate models (RCMs), often is done to examine impacts to smaller areas, for example, where Hadley GCM simulations are linked with ECHAM4/OPYC simulations (Hurk et al. 2005). Some research has investigated urban drainage system and hydraulic performance affected by urban rainfall extremes using climate projections from GCMs (e.g. Semadeni-Davies et al. 2008, Nie et al. 2009, Willem et al. 2012, Berggren et al. 2012). The geographical distribution of urban flooding is expected to increase in the future, as will both the flooding frequency and the duration of floods. Much of the research done in urban areas, however, has focused on the temperate, developed world. Southeast Asia, on the other hand, is a region that is highly susceptible to climate change impacts, yet relatively little has been done to assess adaptation measures for major cities in the region. Thus the objective of this study is to analyze the impact of climate change in terms of increased rainfall volume and intensity, and evaporation, on the hydraulic performance of the sewer system in Rattanakosin Village, Thailand, using PCSWMM. The existing urban drainage model for Rattanakosin Village was used to analyze the impact of climate change (Chaosakul et al. 2009, Chaosakul et al. 2013). 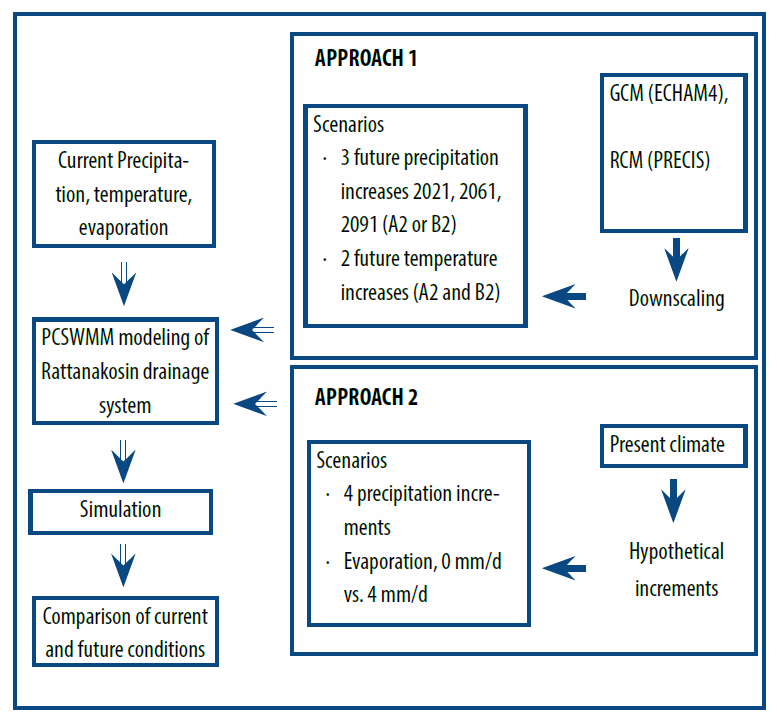 To address the objective of climate change impact on the hydraulic performance of the sewer system in Rattanakosin Village, two approaches for generating future climatic scenarios were followed. Approach 1 (Figure 1) uses GCM data and spatial downscaling to our project area. The GCM ECHAM4 (Roeckner et al. 1992, Roeckner et al. 1996), developed by the Max Planck Institute for Meteorology and its datasets were used together with the PRECIS Regional Climate Model, developed by the Meteorological Office Hadley Centre (http://www.metoffice.gov.uk/precis/intro). ECHAM4 is a spectral transform model with nineteen atmospheric layers and has a spatial resolution of T42 (which approximates to about 2.8° longitude and latitude resolution). The downscaled data were extracted from the Southeast Asia START Regional Center, Climate Data Distribution System, Thailand (http://cc.start.or.th/). The future rainfall and temperature data from 2013 to 2099 were generated using the IPCC (Intergovernmental Panel on Climate Change) generalized A2 and B2 scenarios. Figure 1 Study approach examining climate change scenarios. Rattanakosin Village is a peri-urban community that essentially has become a suburb of Bangkok (Figure 2). It is in Rangsit municipality located in the southern part of Pathumthani province of Thailand, and the climate is a tropical wet and dry monsoon. The drainage network in Rattanakosin Village covers an area of 2.5 km2. The water bodies near the project area include an excavated lake, Boeng Yai, which has a surface area of 0.10 km2 and is 5 m to 7 m deep; the other two water bodies nearby the village are the Rangsitprayoonrasak and Premprachakorn canals. Rangsitprayoonrasak Canal (16 m wide and 2.5 m deep) is to the south of the village and is used for irrigation and flood protection purposes and drains to the Chaopraya River. Premprachakorn Canal is an excavated canal connected to Rangsitprayoonrasak Canal and is also used for drainage and irrigation purposes. It is located to the west of the village and is 10 m wide and 2.1 m deep (Figure 2). The village is relatively old and the elevation of the ground area is well below the road elevation. Due to the flat terrain, surface flooding regularly occurs during storm events, although Rangsit Municipality has installed three pumps to help control flooding problems. Moreover, the village’s wastewater is directly discharged to the two local canals without any treatment after the onsite domestic wastewater treatment systems. 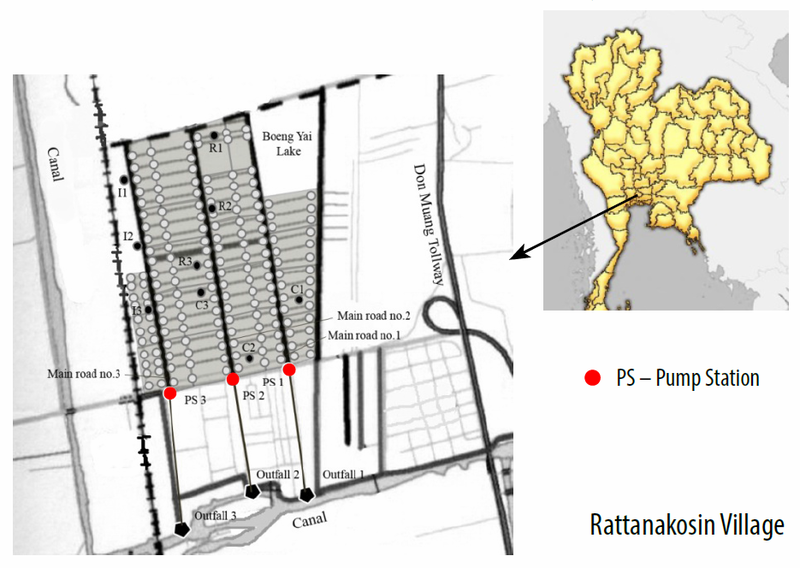 Figure 2 Rattanakosin Village study area showing modeled sewer network. As part of an earlier modeling effort, Chaosakul et al. (2009) divided the Rattanakosin drainage system into a network consisting of 28 subcatchments, 218 junctions and 221 conduits. The total length of the conduits was 18 415 m. There are four outfalls: one is gravity, and three are pumped. The Green–Ampt infiltration model and kinematic flow routing were used for the simulation. Manning’s roughness coefficient for impervious areas was selected as 0.01 and for pervious areas was selected as 0.1. Percentage of impervious area is 10% to 20% and average surface slope is 0.5%. The rainfall stations near the project area are Don Mueang Airport and Suvarnabhumi International Airport. As the Don Mueang airport is closer (<8 km aerial distance) to Rattanakosin Village, the rainfall of Don Mueang Airport was considered for the current situation simulation of the drainage system. Daily rainfall data from Don Mueang Airport for the past 30 y is shown in Figure 3. 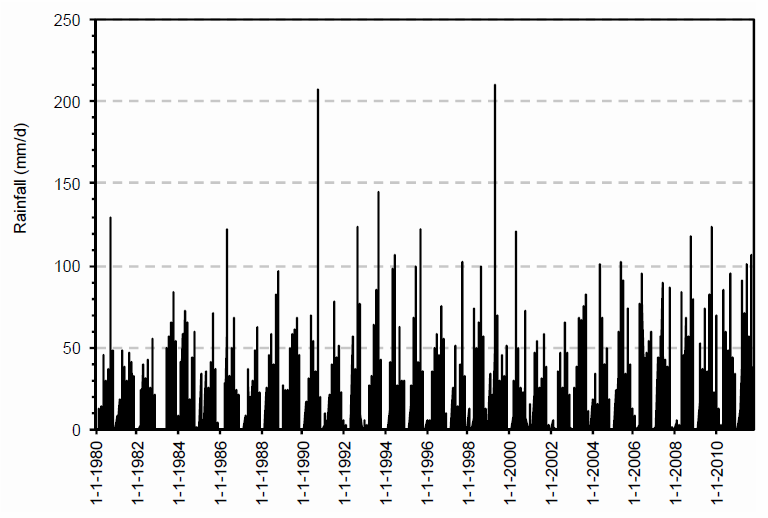 The daily mean value for the 30 y period of record is 3.87 mm which is close to year 2000 (Figure 4). 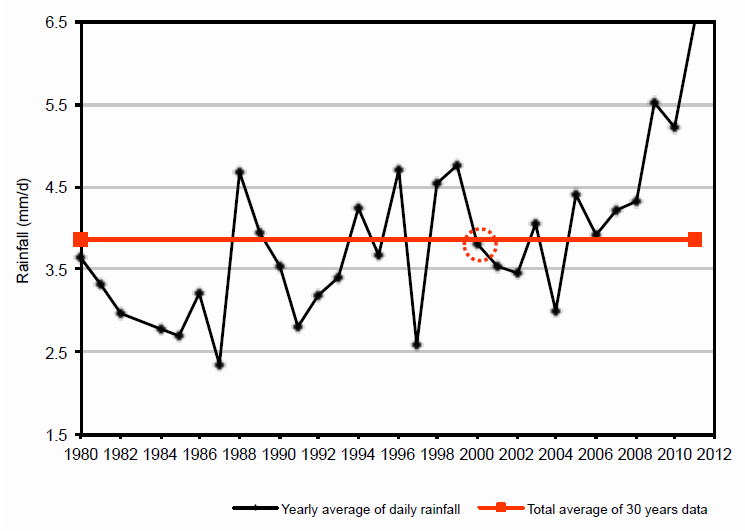 Hence, 2000 was assumed to be the average year and used as the current (baseline) rainfall in the simulation. Figure 5 shows daily temperature data (°C) for 2000 from Don Mueang Airport, station ID 484560 99999 (ftp://ftp.ncdc.noaa.gov/pub/data/gsod/2000/). Figure 3 30 y daily rainfall data of Don Mueang Airport. Figure 4 Mean daily rainfall for the past 30 y, Don Mueang Airport. 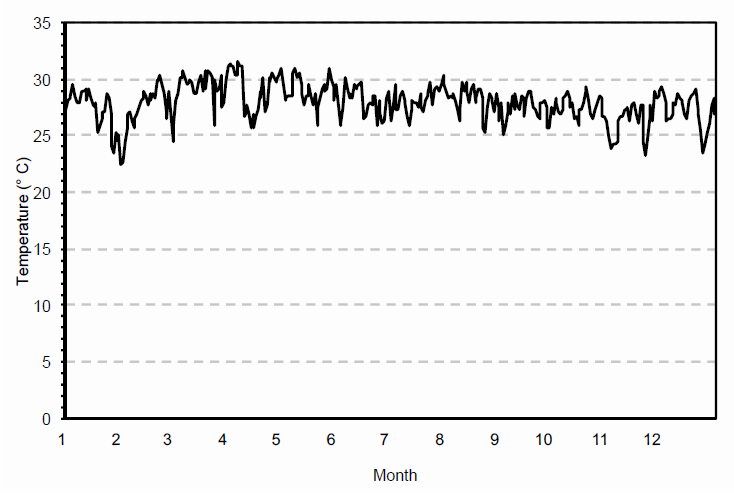 Figure 5 Daily temperature data (2000) for Don Mueang Airport. The IPCC was jointly established by the World Meteorological Organization and the United Nations Environment Program to assess the scientific, technical and socio-economic information relevant to an understanding of the risk of human-induced climate change. IPCC, in their Fourth Assessment Report (AR4) explained that for the late twentieth century a worldwide increase in the frequency of extreme rain storms is most likely to occur due to global warming and this trend of extreme events is most likely to continue into the 21st century (IPCC 2007, ch. 5, Houghton et al. 1996). IPCC (2007, ch. 5) further defined this extreme as events relevant to disaster risk management, such as events of urban floods. The IPCC estimates that future increases in greenhouse gases will lead to an increase in temperature of between 1 °C and 3.5 °C (Houghton et al. 1996) and an increase in sea level of between 13 cm and 94 cm (Warrick et al. 1996) by 2100. In 1996, the IPCC developed a new set of emission scenarios which are alternative images of how the future might unfold and a tool with which to analyze how driving forces may influence future emission outcomes and to assess the associated uncertainties. They assist in climate change analysis, including climate modeling and the assessment of impacts, adaptation and mitigation. The possibility that any single emission path will occur as described in the scenarios is highly uncertain. Four different narrative storylines (A1, A2, B1 and B2) were developed by the IPCC to describe the relationships between emission driving forces and their evolution and add context for the scenario quantification (IPCC 2000). Each storyline represents different demographic, social, economic, technological and environmental developments. For each storyline several different scenarios were developed using different modeling approaches to examine the range of outcomes arising from different models that use similar assumptions about driving forces. The A1 storyline assumes a fast growing economy, new or efficient technologies, and a population peak around mid-century and decline thereafter. A1 has subgroups of fossil intensive (A1FI), predominantly non-fossil energy sources (A1T), and balanced use of all sources (A1B). The A2 storyline summarizes the future world as very heterogeneous with the preservation of local identities. Economic development is primarily regionally oriented and per capita economic growth and technological change are more fragmented and slower than in other storylines, while there is a continuously increasing global population. In the B1 storyline the global population is as in A1, but with clean and resource efficient technologies. In the B2 storyline, the future world depends on local solutions for economic, social and environmental sustainability. Global population continuously increases at a rate lower than A2, with intermediate levels of economic development, and less rapid and more diverse technological change. The scenario is further oriented toward environmental protection and social equity, and it focuses on local and regional levels. The total cumulative carbon dioxide emissions in the A2 scenario are projected as slightly greater in range than B2 and other scenarios, but there is considerable overlap in the emission level for the two scenarios by 2100 (IPCC 2000). IPCC is further improving their assessments (in AR5), considering mitigation to reduce future emissions due to environmental concerns and hence replacing the SRES scenarios with four benchmark scenarios referred to as representative concentration pathways (RCPs). RCPs are defined by selecting concentration pathways and the associated radiative forcing in 2100 rather than storylines defining the drivers behind emission. Since AR4 was in publication at the time of this study, SRES scenarios have been used. Three time periods were examined with respect to forecast rainfall intensity and temperature for the A2 and B2 scenarios: 2018 to 2027, 2054 to 2063, and 2090 to 2099. Analysis of the two scenarios, filtered through the downscaled data, showed that the B2 scenario in all three time periods had a maximum precipitation that was higher than in the A2 scenario. 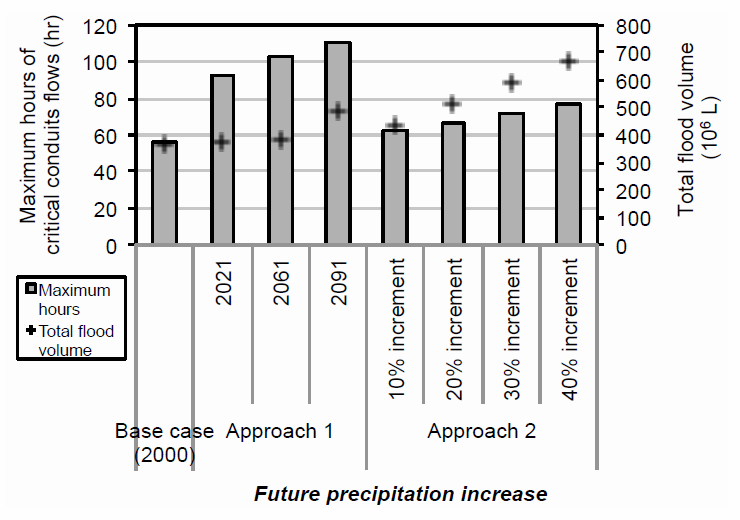 Hence, three simulations for precipitation effect were run in PCSWMM for the years 2021, 2061 and 2091 (Figure 6) using B2 at an interval of 1 h.
Figure 6 Future rainfall of 2021, 2061 and 2091. 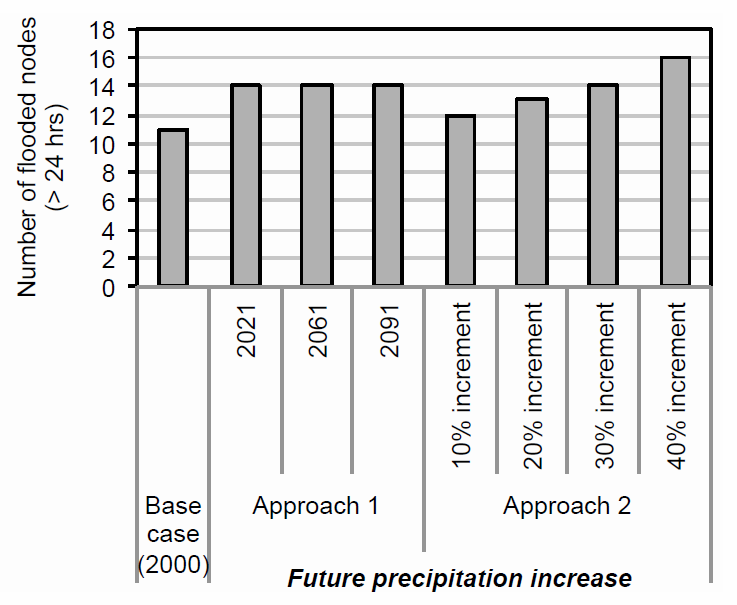 Approach 2, with hypothetical increments, illustrates the increased daily precipitation with similar rainfall shape as the rainfall of 2000 but increased by different percentages (10%, 20%, 30% and 40% increases). The four precipitation scenarios were run using no evaporation and the maximum evaporation currently observed for Thailand (4 mm/d, Kongborrick and Suebsak 2011) to also investigate the impact of evaporation. When precipitation only is run through the different scenarios (evaporation is set to 0 mm/d), for both approaches (RCM downscaling and percentage increase) the results show the number of flooded nodes increased marginally over current conditions (by 3 to 6, depending on the scenario), but the hours of critical conduit flow increased progressively to the year 2091 where they nearly doubled in time (Figures 7 and 8). Surface flooding volume also increased progressively from 2021 to 2091 over the current conditions (Figure 8). The increased surface flooding volume by 2091 is in a similar range as that projected by between a 10% and 20% increase in rainfall (Figure 8). Figure 7 Number of flooded nodes for >24 h, maximum hours of critical flow and total flood volume, considering precipitation only. Figure 8 Maximum hours of critical conduit flow and total flood volume considering precipitation only. The results indicate that more surface flooding will be expected in the future. The number of critical nodes in the system and the number of pipes performing over their capacity also will increase due to the greater expected rainfall. It was noticed that the current condition of the pipe system does not have an appropriate gradient, although the pipe diameter (1 m) is quite sufficient. As the pumps currently are installed at the downstream end of the system, they do not completely drain water effectively during high flooding situations. One of the mitigation measures could be to install higher capacity pumps, but increasing downstream pump capacity does not solve the flooding problem completely. Furthermore, based on discussions with operators, current pump rules are implemented in an ad hoc fashion which is difficult to represent in the model. One of the recommendations for solving current flooding problems is to install intermediate pumps in the middle of the catchment to prevent the overloading and surcharge of pipes downstream. Chaosakul et al. (2013) showed that extensive LID implementation, combining bioretention cells and rain barrels, could eliminate surface flooding in the village for a current 2 y design storm. In their modeling effort that examined LID performance at a watershed scale, Holman-Dodds et al. (2003) showed that, in general, LID technologies become less effective at higher rainfall amounts, which is a potential concern for the climate change scenarios. An unpublished report by Drexel University and the New York City Department of Parks and Recreation found that green infrastructure installed in Cambria Heights, Queens was able to retain 100% of total inflow produced during superstorm Sandy (October 2012), and 79.3% of total inflow during hurricane Irene (August 2011). However, there is limited published information on LID performance under larger storm events and if such technologies are to be considered as a climate change adaptation measure, empirical performance studies are needed. While it was beyond the scope of this study to model different pump operation or LID scenarios (and including cost estimates), PCSWMM would be a good tool to investigate these adaptation measures in future work. It has long been known that evaporation rates are related to temperature, as well as other meteorological variables such as wind velocity, radiation exchange, and vapour pressure (e.g. Thornthwaite and Holzman 1939, Priestley and Taylor 1972) and numerous comparisons have been made between different approaches to estimate evaporation rates (e.g. Federer et al. 1996, Xu and Singh 1998, Rosenberry et al. 2007). The sensitivity of evaporation estimates using different methods under climate change scenarios has been evaluated (McKenney and Rosenberg 1993) and there can be differences in both magnitude and direction of change, depending on the equations used and the inclusion of specific variables. To our knowledge, evaporation rate estimates under climate change scenarios for Thailand are not readily available, but Kongborriak and Suebsak (2011) report the current maximum evaporation to be 4 mm/d. In SWMM, evaporation can be estimated either outside the model and read as an input time series, or constant monthly rates can be input. Algorithms for processes like infiltration and recovery of infiltration capacity really do not directly consider temperature, but input evaporation rates only. Although temperature will affect rainfall characteristics under climate change scenarios, this impact already is accounted for in the GCM modelling. For simplicity, evaporation impacts were explored using Approach 2, with the four precipitation increments and evaporation rates set to 0 mm/d and 4 mm/d (i.e. the current reported maximum rate in Thailand). Interestingly, 4 mm/d is similar to the 30 y norm mean daily rainfall and the 2000 mean daily rainfall (Figure 4). Under the A1B scenario, IPCC (2007, ch. 5) suggests annual mean evaporation would increase by 0.1 mm/d in 2090–2099 relative to 1980–1999, and a value of 4 mm/d therefore seems to be a reasonable starting point for assessment. Figures 9 and 10 show the comparison of PCSWMM runs using 0 mm/d and 4 mm/d evaporation options. When the evaporation rate of 4 mm/d was included in the simulation, the maximum hours of critical conduit flow and total flood volume in each scenario decreased minimally by about 1.61% to 2.05% and by 0.86% to 1.08% respectively. Figure 9 Maximum hours of critical conduits flows above normal flow change by evaporation effect. 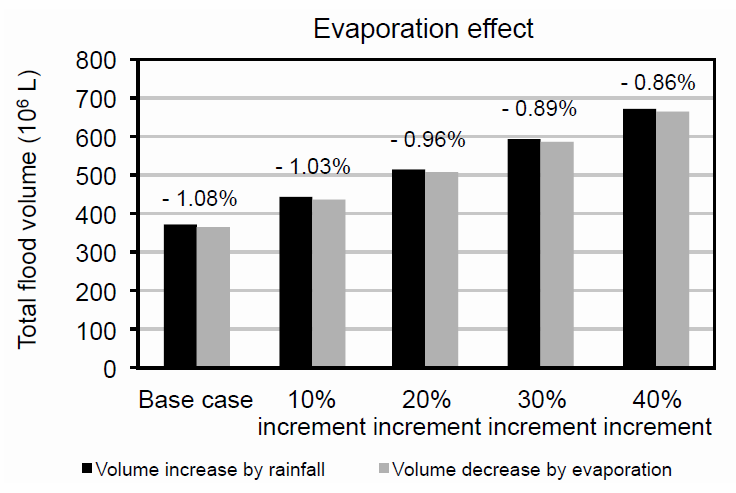 Figure 10 Total flood volume change by evaporation effect. Considering all the scenarios and the existing infrastructure within Rattanakosin Village, the following recommendations could be considered to overcome the future flooding challenges. First, LID technologies can be implemented to reduce storm water peak discharge and surface flooding. Then, in order to overcome the low capacity of the drainage network an additional three pumping stations could be constructed at mid locations within the village system. Finally, flood gates to prevent backflow into the sewer system can be a good solution to protect the village during extreme flood events. The proper assessment of adaptation measures (including costing) must be done prior to the implementation for effective adaptation strategies. The drainage system in Rattanakosin Village is expected to be impacted by climate change resulting in increased precipitation and evaporation. Based on model results, the number of flooded nodes increased as did the surface flooding frequency and the duration of floods. Increased rainfall intensity and total depth appear to have a bigger impact on flooding characteristics than increasing evaporation rate. PCSWMM results show that greater surface flooding can be expected under the various climate change scenarios. As there is a shortage of data at the regional scale and uncertainties in climate projection, the recommendations for future work would be correction and validation of the climate model output including development of measures for adaptation and mitigation strategies to cope with these impacts. In particular, changes in evaporation rates expected for Thailand under different climate scenarios should be investigated in more detail. Thank you to the Swiss funded National Center for Competence in Research (NCCR) North–South program. An earlier version of this study was done as part of the ED78.15 and ED789022 class project at AIT. Thanks to Dr. Sam Shamsi for the suggestion to consider evaporation effects in addition to rainfall. The PCSWMM license for this work was provided through CHI’s University Grant program. The study was done while K. N. Irvine was on sabbatical at the National Institute of Education, Nanyang Technological University, Singapore. Berggren, K., M. Olofsson, M. Viklander, G. Svensson and A. Gustafsson. 2012. “Hydraulic Impacts on Urban Drainage Systems due to Changes in Rainfall caused by Climate Change.” Journal of Hydrological Engineering 17 (1): 92–8. Chaosakul, T., K. C. Wijekoon, P. Kijjanapanich, T. Udom, C. Siripong, N. H. Dang, K. Sin, N. Samantarat, T. Koottatep, K. N. Irvine, J. Zumfelde and J. Bakert. 2009. “Modeling a Peri-Urban Combined Sewer System to Assess Drainage Improvements: A Case Study of Rattanakosin Village, Thailand.” In The 7th International Symposium on Southeast Asia Water Environment, Bangkok, Thailand, 2009, 309–17. Reprinted in Southeast Asian Water Environment 4, edited by K. Fukushi, F. Kurisu, K. Oguma, H. Furumai and P. Fontanos. London: IWA Publishing. ISBN 9781843393627. Federer, C. A., C. Vorosmarty and B. Fekete. 1996. “Intercomparison of Methods for Calculating Potential Evaporation in Regional and Global Water Balance Models.” Water Resources Research 32 (7): 2315–21. Hirschman, D. J., D. S. Caraco and S. R. Drescher. 2011. “Linking Stormwater and Climate Change: Retooling for Adaptation.” Watershed Science Bulletin (Spring): 11–8. Houghton, J. T., L. G. Meiro Filho, B. A. Callander, N. Harris, A. Kattenberg and K. Maskell. 1996. Climate Change 1995: The Science of Climate Change—Contribution of Working Group 1 to the Second Assessment Report of the Intergovernmental Panel on Climate Change. Cambridge: Cambridge University Press. Hurk, B., J. Beersma and G. Lenderink. 2005. “Hydrological Simulations in the Rhine Basin.” Water Science and Technology 51 (5): 1–4. IPCC. 2007. IPCC Fourth Assessment Report: Climate Change 2007 (AR4)—Working Group 1 Report, The Physical Science Basis. Geneva: IPCC (Intergovernmental Panel on Climate Change). http://www.ipcc.ch/index.htm#.UvBRgf3d2N8. Irvine, K. 2013. "Climate Change and Urban Hydrology: Research Needs in the Developed and Developing Worlds." Journal of Water Management Modeling 21: R246-11. doi: 10.14796/JWMM.R246-11. Kongborriak, P. and K. Suebsak. 2011. Evaporation in Thailand period 10 year (2001–2010); Annual report, Meteorological Department of Thailand. http://www.tmd.go.th/info/proceedings.pdf. McKenney, M. S. and N. J. Rosenberg. 1993. “Sensitivity of Some Potential Evapotranspiration Estimation Methods to Climate Change.” Agricultural and Forest Meteorology 64:81–110. Nie, L., O. Lindholm, G. Lindholm and E. Syversen. 2009. “Impacts of Climate Change on Urban Drainage Systems: A Case Study in Fredrikstad, Norway.” Urban Water Journal 6 (4): 323–32. Priestley, C. H. B. and R. J. Taylor. 1972. “On the Assessment of Surface Heat Flux and Evaporation Using Large Scale Parameters.” Monthly Weather Review 1002 (2): 81–92. Roeckner, E., K. Arpe, L. Bengtsson, S. Brinkop, L. Dümenil, M. Esch, E. Kirk, F. Lunkeit, M. Ponater, B. Rockel, R. Sausen, U. Schlese, S. Schubert and M. Windelband. 1992. Simulation of the Present Day Climate with the ECHAM Model: Impact of Model Physics and Resolution, MPI Report (1987–2004) 93. Hamburg: Max-Planck-Institut für Meteorologie. Roeckner, E., K. Arpe, L. Bengtsson, M. Christoph, M. Claussen, L. Dümenil, M. Esch, M. Giorgetta, U. Schlese and U. Schulzweida. 1996. The Atmospheric General Circulation Model ECHAM-4: Model Description and Simulation of Present Day Climate, MPI Report (1987–2004) 218. Hamburg: Max-Planck-Institut für Meteorologie. Rosenberg, E. A., P. W. Keys, D. B. Booth, D. Hartley, J. Burkey, A. C. Steinemann and D. P. Lettenmaier. 2010. “Precipitation Extremes and the Impacts of Climate Change on Stormwater Infrastructure in Washington State.” Climate Change 102 (1–2): 319–49. Rosenberry, D. O., T. C. Winter, D. C. Buso and G. E. Likens. 2007. “Comparison of Fifteen Evaporation Methods Applied to a Small Mountain Lake in the Northeastern U.S.A.” Journal of Hydrology 340:149–66. Semadeni-Davies, A., C. Hernebring, G. Svensson and L.-G. Gustafsson. 2008. “The Impacts of Climate Change and Urbanisation on Drainage in Helsingborg, Sweden: Combined Sewer System.” Journal of Hydrology 350:100–13. Thornthwaite, C. W. and B. Holzman. 1939. “The Determination of Evaporation from Land and Water Surfaces.” Monthly Weather Review 67:4–11. Warrick, R. A., C. Le Provost, M. F. Meier, J. Oerlemans and P. L. Woodworth. 1996. “Changes in Sea Level.” In Climate Change 1995: The Science of Climate Change, edited by J. T. Houghton, L. G. Meira Filho, B. A. Callander, N. Harris, A. Klattenberg and K. Maskell, 359-405. Cambridge: Cambridge University Press. Waters, D., W. E. Watt, J. Marsalek and B. C. Anderson. 2003. “Adaptation of a Storm Drainage System to Accommodate Increased Rainfall Resulting from Climate Change.” Journal of Environmental Planning and Management 46 (5): 755–70. Willem, P., K. Arnbjerg-Nielsen, J. Olsson and V. T. V. Nguyen. 2012. “Climate Change Impact Assessment on Urban Rainfall Extremes and Urban Drainage: Methodologies and Difficulties.” Atmospheric Research 103:106–18. doi:10.1016/j.atmosres.2011.04.003. Xu, C.-Y. and V. P. Singh. 1998. “Dependence of Evaporation on Meteorological Variables at Different Time Scales and Intercomparison of Estimation Methods.” Hydrological Processes 12:429–42.